A newly discovered pig manure bioadhesive has been developed by civil engineer Ellie Fini and a team at North Carolina Agricultural and Technical State University. Turns out the oils in swine manure are similar to petroleum, but are too low-grade for gasoline and perfect for asphalt. First, just to be clear, the asphalt created with this pig manure bioadhesive does not create an offensive odor. The odor-causing parts of the manure are removed during processing. 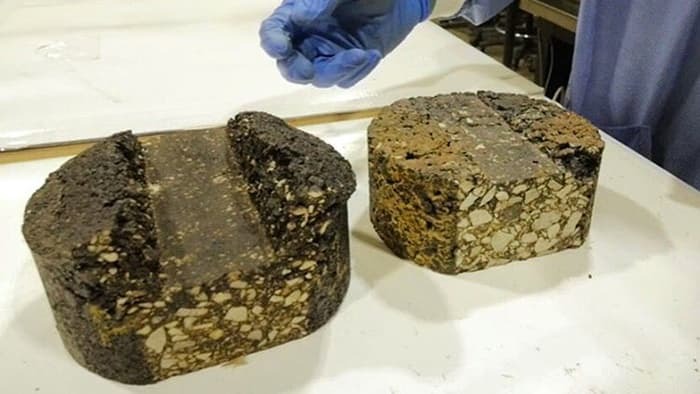 “It is different from petroleum refinery, which distills crude oil to produce mainly fuel and leave the residue for asphalt,” Ellie Fini, lead researcher and assistant professor of civil engineering, told Gizmag. “Here we produce bio-adhesive from breaking bio-mass molecular structure and re-synthesizing the bio-adhesive structure. Bio-adhesive is lower in cost, requires less heat for mixing and compaction and is more durable.” The adhesive costs $0.56 per gallon to process, much less than traditional petroleum-based asphalt binders. Scarcity of the raw materials for this new adhesive will not be a problem – 43 billion gallons of pig manure are generated around the world each year. Use of the product also solves another environmental issue – the increasing smell in areas with a lot of pig farms. The bioadhesive material is currently undergoing testing to make sure it meets Department of Transportation standards. Tests include a simulation of truck traffic equal to 20,000 passes over it. So far, the product has passed DOT specifications. The research has been funded by several grants from the National Science Foundation, and will hopefully be brought to market soon. The group has filed patents on the technology, and set up a company called Bio-Adhesive Alliance to help ramp up production. Can’t wait to smell that first road paved with pig manure!